While I was attending the Rotary International Convention, I was so fortunate to see Vivid Sydney which is an annual event of light, music, and ideas. This is a collection of free public exhibition of outdoor lighting sculptures and installations all over Sydney from the Circular Quay to Darling Harbour. One of my highlights was the illumination of the Sydney Opera House. 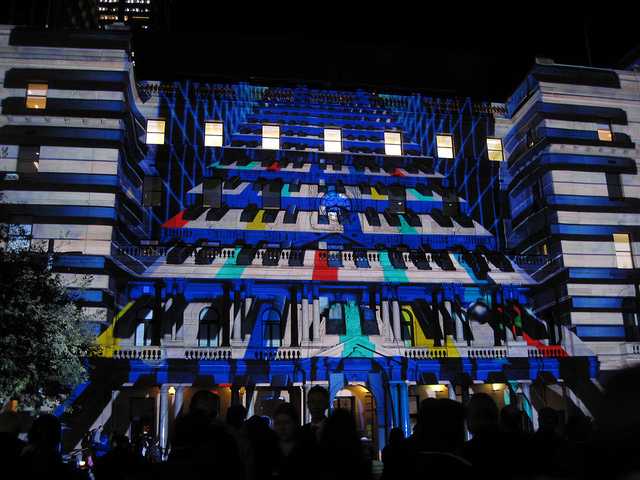 They had a soundtrack that accompanied the illumination which could be hear from outside the Sydney Opera House. I had only seen “End Polio Now. Thanks Rotary.” sign projected on the Opera House so it was even more engaging to see fish, lava, and water making their respective appearances during this event. I tried to capture the images to share with everyone. I wish that I had a tripod because you really need to be still as possible when taking these types of photos or they will just be blurry when printing. After enjoying the Opera House, several other buildings were illuminated within viewing distance including the Marriott and the Museum of Contemporary Art (MCA). To give you a little more detail about the light shows, the MCA building illuminated project, Gamma World was created by artist Jess Johnson and Spinifex. The project goes on an integrated journey, constantly changing its appearance from isometric designs to slithering snakes. The animation and 3D visual effects tricks keep you glued for the entire show. I wanted to take photos but by the time I could manage to still my hands, the images had come and gone! This made me put the camera down and see the creative genius right before my eyes. I love how the buildings were getting to come to life in a unique way. One minute, bright red singing lips are serenading you and the next, a trumpet is blaring into your eyes and vibrating off the MCA. I loved how everyone was congregating around the famous buildings and stopping to enjoy the artistic,technical, and inspiring. My favorite one was the 3D-mapped projection at the Customs House which was essentially a jukebox projection by the Danny Rose Design Team! Each ‘sculpture’ depicted a family of musical instruments which were ‘played’ in real time. For example, after a song ended, ‘Play Me’ would be projected upon the screen and someone could choose one of the ‘musical sculptures from a touch screen. Say I chose the piano musical sculpture. Soon after, the piano would be projected upon the house and ‘come to life’ with bright lights, form, and sound. Growing up, I loved tickling the ivories and miss those good ole days. 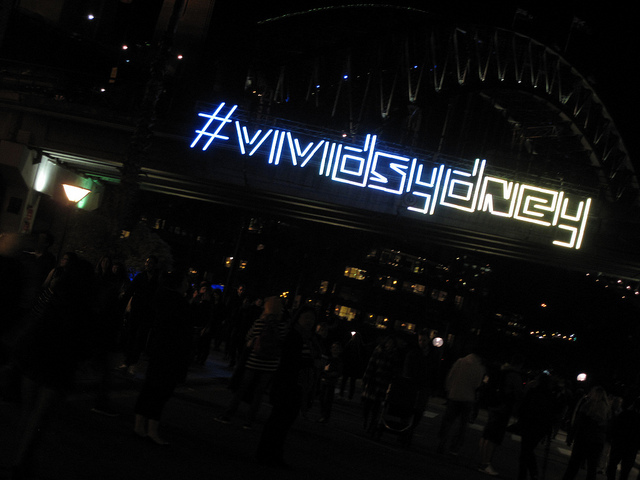 Unfortunately Vivid Sydney ends on June 9th so if you don’t catch it time, head over to their Facebook Page and look at the incredible photos and videos that were captured from the most cutting edge forms of light, music, and ideas I have ever witnessed. Thank you to all the artists! Because of your creative genius, people from all around the world can be inspired to reach new depths in 3D imaging and illumination. I was so lucky to see it with my own eyes!